"In The Footsteps Of Rome" - Is Renewal Possible? Once the shared memories of these values are lost, the Empire ceases to exist; there is nothing left to reform or renew. Is renewal / recovery from systemic decline possible? The history of the Roman Empire is a potentially insightful place to start looking for answers. As long-time readers know, I've been studying both the Western and Eastern (Byzantine) Roman Empires over the past few years. Both Western and Eastern Roman Empires faced existential crises that very nearly dissolved the empires hundreds of years before their terminal declines. 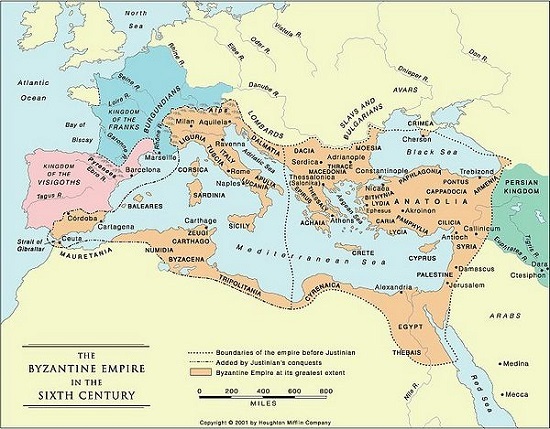 The Western Roman Empire, beset by the overlapping crises of invasion, civil war, plague and economic upheaval, nearly collapsed in the third century C.E. (Christian Era, what was previously A.D.) -- 235 to 284 C.E., fully two hundred years before its final dissolution in the fifth century (circa 476 C.E.). Meanwhile, the Eastern Roman Empire (Byzantine Empire) faced similar crises in the seventh and eighth centuries, as its capital of Constantinople was besieged by the Persians in 626 C.E. and the Arab caliphate in 674 C.E. and again in 717 C.E. The invasions which preceded the sieges stripped the empire of wealthy territories and the income those lands produced. In both cases, the Empire not only survived but recovered a substantial measure of its former resilience and stability. Fortune delivered strong leadership at the critical moment: leadership that was able to protect itself from petty, self-aggrandizing domestic rivals, force the reorganization of failed, self-serving bureaucracies, inspire the populace to make the necessary sacrifices for the common good, win decisive military victories that ended the threat of invasion, and generate a moral claim to leadership via personal rectitude and/or participation in a religious revival. Absent such strong, stable, legitimate leadership, neither empire would have survived their existential crisis. But strong leadership alone isn't enough. A strong military leader can win battles, and a strong political leader can aggregate power, but these are merely steps to the ultimate goal of strong leadership, which is to reform the Imperial system so it once again serves the needs of the entire Empire rather than just the greed of the few at the top of the wealth-power pyramid. The system itself must still hold the potential to be reformed. If the systems of communication, trade, control and finance have all eroded beyond the point of no return, then the victories of a strong leader die with that leader. The army must still have the means to recruit new legions, the Treasury must still have a system to collect tax revenues, the central leadership must have a way to communicate with far-flung commanders and local leaders, and so on. The collective shared memory of imperial cohesion and competence must still exist in the general populace. Any political group identity, be it tribe, village, nation or empire, is anchored by a shared awareness of membership, i.e. the rights and responsibilities of belonging, and a collective memory of the group / empire as a functioning whole that served the many and not just the few. Once the shared memory of the Empire as a functioning whole is lost, the entire notion of empire is lost. The leadership in these existential crises of the third century C.E. in the West and the eighth century in the East could still draw upon a collective memory of a functioning empire. Residents had not yet lost the shared memory of serving in the army, of paying taxes, of stable trade protected by the Empire, of a stable Imperial currency, and so on. We are far down the road to a system that serves the few at the expense of the many. The collective memory of a system that once served the common good is fading. Strong leadership can still wrest popular political power from the self-serving elites atop the wealth-power pyramid and wield this political power to reform the system so it serves the many instead of just the few, but the window for such reform /renewal is closing fast. In another decade, a living system that served the common good rather than just the interests of a few will be as distant as the shattered monuments of ancient Rome.